This tank is an attempt to be as Ecologically Sustainable as possible. All living creatures are to be Aquacultured. This aquarium is meant to be a study of the species of the Genus Euphyllia. Will give preference to Para types (branching) to make it easier to prune, due to small size of tank 55 Litres. Battling over fish species. Main restraints, must be Tank Bred and natural range due to small size of tank. Looks like I will opt for the easy route of Clown Pair or Single Clown (ocellaris) and neon goby pair. Decisions decisions. Zoanthid Bam Bam Reef Works Cultured Zoanthus sp. Zoanthid Gorilla Niplle Frag Zoanthus sp. Zoanthid Whamin Watermelons Frag Zoanthus sp. On average you perform a 18.9% water change every 8 days. Complete Re Scape and 100 water change on M40. 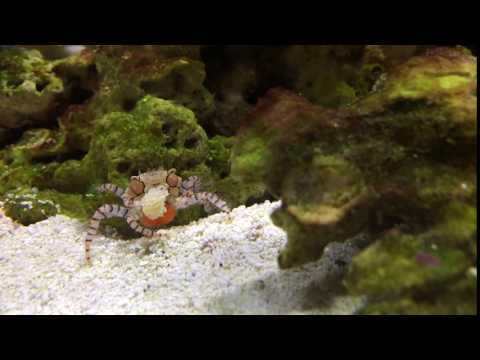 Corals , fish and Pom Pom Crab in quarantine during re scape. Dyno X tratment was completed two days ago was last dose.. did 20% water change re charged reactor with carbon and phosguard. cleaned heater, pump, skimmer and pump, reactor. After much research and reading Banggai Cardinalfish: A Guide to Captive Care, Breeding & Natural History. I have chosen two Banggai Cardinal Tank Bred and one Ocellaris Clown Tank Bred. I am planning on keeping this tank as close as possible to a Sulawesi - Indonesian reef with mainly Euphyllia Species. After consulting the experts opinion in this field I have found the Banggais and clown grouping ideal for this size tank. Unfortunately after much searching I have come to the conclusion that any Crustaceans will not be aquacultured.